Coaching is a consciousness raising modality that empowers the coachee to know with 100% confidence they have the answers to the challenges they’re facing intrinsically inside of them. Because they do. Coaching helps people shift perspective, gain deeper personal insight, minimize personal practices that hinder (self-doubt, judgement, comparison) and employs specific mechanisms to put effective plans in place to make desired changes lasting + sustainable. hierarchy of power that encourages clients to seek answers externally from the therapist. Instead of learning how to build self trust, develop personalized skill sets and resource for themselves, many clients become dependent on their therapist to provide the relief + insight they seek: I believe this is a slippery slope. 1. It gives away your power. Personally I will never subscribe to the idea that there is a person out there that knows better than I do about what is best for me. Can you glean valuable insights and information from others with different skill sets? Absolutely and it would be foolish not to, but don’t leave the final verdict on your well-being up to another person – I don’t care how many letters they have behind their name. Self-trust is a much more important credential than any institution could ever give out. 3. Accountability ByPass. If I hire a helping professional to give me the answer, they do, I put said “answer” into practice and it backfires – who do I blame for this? Yep – the professional, thereby bypassing any personal accountability for the train running off the tracks. I can now rest in the relief that I have evidence the issue I was attempting to resolve through the therapeutic process is out of my control, unchangeable, unresolvable. After all – if a therapist can’t “fix it”, who can? 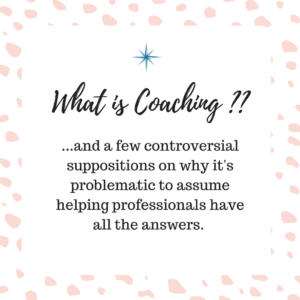 Coaching counteracts ALL of these dynamics because they directly conflict with the primary coaching premise that the coachee is the expert in their own lives, thereby coaches CAN’T provide the answer (or take credit for it, or get blamed for it!). 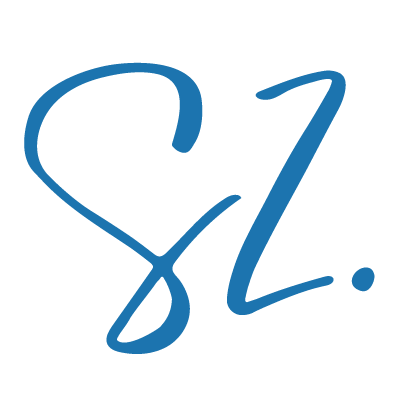 It’s really a lovely win:win if you are looking to up your personal development game. Helping professionals have tools rooted in evidence based practices that have great value and as a social worker I’m happy to have them. Much of the work I do with clients is based in Cognitive Behavioral Therapy, Mindfulness + Somatics – I take a “whole person” approach. which is why I’m a coach 1st, and a therapist 2nd. Here’s the Truth -> If you are someone who is looking to check a box, you’ll get NO judgement from me. I’ve searched for those quick fixes as well + understand why you would. But – if the easy button worked – we would ALL be pushing it, the coaching industry wouldn’t be a $1 billion industry that is rapidly growing, I would be out of a job (+ moreover a personal life philosophy).